April 2018 www.coalage.com 17 longwall mining continued Safety valve set pressure can range from 10% to 20% higher than the operat- ing pressure. This is set by the OEM based on system requirements. Using high pres- sure and high flows require high horse- power motors that are usually 4,160 volts. 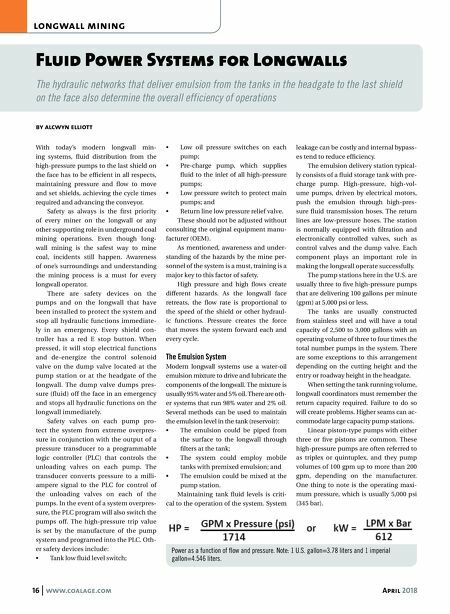 Operating system pressures can range from 4,350 psi (300 Bar) to 4,785 psi (330 Bar) with the maximum at 5,000 psi (345 bar) based on the pressure losses due to volume, hose size and distance from the pump station to the tailgate. High volume supply requires the right fluid distribution system to allow effi- cient longwall operations from the pump station to the tailgate. The unload and load cycle of the unloading valve for each pump should be set at a certain percent- age (%) max to min basis and should not be ignored. 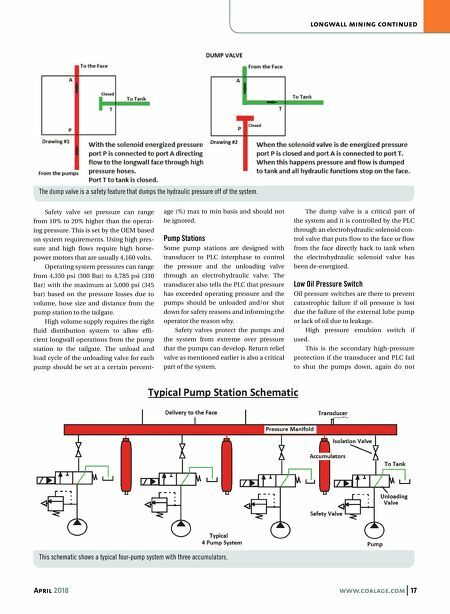 Pump Stations Some pump stations are designed with transducer to PLC interphase to control the pressure and the unloading valve through an electrohydraulic valve. The transducer also tells the PLC that pressure has exceeded operating pressure and the pumps should be unloaded and/or shut down for safety reasons and informing the operator the reason why. Safety valves protect the pumps and the system from extreme over pressure that the pumps can develop. Return relief valve as mentioned earlier is also a critical part of the system. The dump valve is a critical part of the system and it is controlled by the PLC through an electrohydraulic solenoid con- trol valve that puts flow to the face or flow from the face directly back to tank when the electrohydraulic solenoid valve has been de-energized. Low Oil Pressure Switch Oil pressure switches are there to prevent catastrophic failure if oil pressure is lost due the failure of the external lube pump or lack of oil due to leakage. High pressure emulsion switch if used. This is the secondary high-pressure protection if the transducer and PLC fail to shut the pumps down, again do not The dump valve is a safety feature that dumps the hydraulic pressure off of the system. This schematic shows a typical four-pump system with three accumulators.